Our 7th Birthday BBQ Bash! Have you ever reflected on your age and thought ‘how the heck did time go by so fast!!?!’. We are kind of feeling the same way – but with our business. It doesn’t seem so long ago that we sold our first keg out of our small warehouse space, but that was 7 years ago on July 1st! Not that we need any excuse for a party, but seven years in business calls for a memorable celebration with some exclusive beers and, of course, a special food menu! So, on Sunday, July 1st, please join us for a BBQ Pig Roast in celebration of the 7th birthday of Throwback Brewery (and our 3rd year on our beautiful 12-acre farm!). 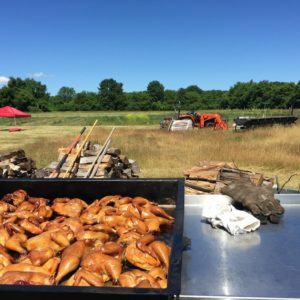 We’ve planned a relaxing, fun day of live music and games in our beer garden, while you enjoy a delicious all you can eat buffet of local, house-smoked pulled pork (from our farm-raised hogs), chicken, and all the fixin’s. From 1-4pm, we’ll have The Chickenshack Bluegrass Band on our beer garden stage. Stomp your feet to the vocals, fiddle, banjo, guitar, and mandolin stylings from this lively bluegrass band from our very own NH Seacoast! Plus Strawberries, Whipped Cream (V, GF), & House-Made Biscuits (V)! Lucky Sevens IPA – featuring seven types of grains, seven varieties of hops, and weighing in at 7.77% ABV! The idea behind this beer is to not only commemorate our 7th birthday, but to also try and embody the community spirit of Throwback and to hopefully share a little of the luck and gratitude we’re feeling with all of you. So a few months back, we all got together and mapped out this Luck Sevens IPA featuring seven types of grains and seven varieties of hops. Each of our four brewers chose a hop to add to the mix, along with Head Chef Carrie, and co-founders Annette and Nicole. We then let the brew team work their magic, and Lead Brewer Chris kept a watchful eye on things, ensuring this beer weighed in at exactly 7.77% ABV (kudos Chris!). Cuvée de la Hobbs Farm – This special mixed fermentation golden ale blends brett-fermented beer from two barrels- a white wine barrel and a gin barrel. The result is a clear, straw-colored beauty with a funky, fruity, and pineapple aroma, with white wine, tropical fruit, pineapple flavor with a funky and bitter finish. Peach & Apricot Barrel-Fermented Sour – attention fans of sours, we are going to release our first barrel-fermented sour ale, which we have finished with peaches and apricots. We used a pinot noir barrel to give this beer some nice fruity undertone. Finally, if the beer gods are smiling on us, our Watta Melon Blonde Ale should be finished and released on July 1st! As always, this will be light and refreshing, and will make you feel like you are at a perfect summer picnic. Ticket price includes tax and gratuity, plus one beer of your choice (soft drinks for kids). Note – this is how the adult ticket price breaks down: it’s essentially $24 for all-you-can-eat of the house-made and farm-grown food we’ll be serving that day, $6 for a beer, and $8 for tax and gratuity. So grab your tickets today before they sell out! Reflecting on 7 years in business- we could not have done it without all of you guys! Thank you so much!